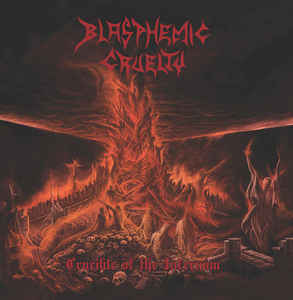 At long last, BLASPHEMIC CRUELTY return from the dead with a new mini-album for HELLS HEADBANGERS, Crucible of the Infernum! Seven long years after their acclaimed debut album for Osmose, Devil’s Mayhem, BLASPHEMIC CRUELTY deliver a four-song nuclear warhead that is truly a Crucible of the Infernum. Led by six-string assassin Gene Palubicki (PERDITION TEMPLE, ex-Angelcorpse), this power-trio remain committed to scabrous-yet-articulate deathrash rooted in the 1980s but loaded up with modern arsenal. Categories: CD-Distribution, DISTRIBUTION, DISTRO STORE. Tags: Death Metal, Hells Headbangers ‎, Thrash Metal. Their attacks are swift yet strategic, forward-momentum surge but fully fleshed-out, the songwriting linear yet never predictable. It’s a timeless metal sound that spans decades, and bolstered by a cover of Sodom’s “The Crippler,” Crucible of the Infernum is the perfect crush/kill/destroy length to inflict maximum ritual carnage – reap the whirlwind!